Mumbai: The Mumbai campus of Prin L N Welingkar Institute of Management Development and Research (WeSchool) was filled with the excitement of parents and students of the graduating batches of PGDM 2014-16 at the Convocation ceremony this morning. 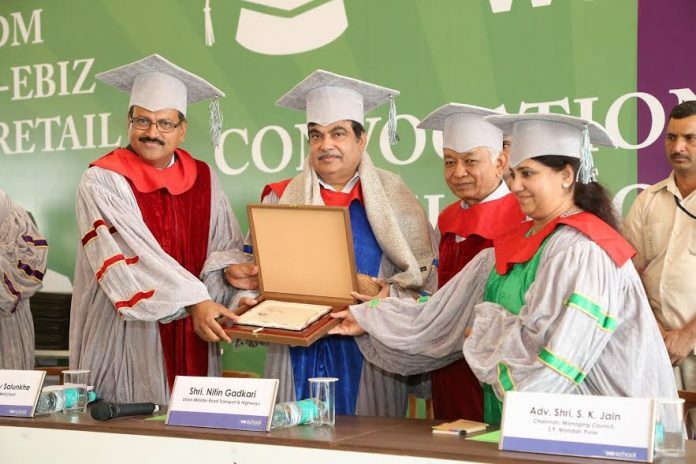 What made the convocation special was the presence of Shri Nitin Gadkari, Hon’ble Union Minister for Road Transport & Highways as its Chief Guest. Shri Nitin Gadkari along with Advocate Shri S K Jain, Chairman, Managing Council S P Mandali and Local Managing Committee, WeSchool and Group Director Prof Dr Uday Salunkhe presented the Convocation Certificates to the graduating batches from its Mumbai and Bengaluru campuses. Smt Madhuri Misal, Member Managing Council, Shikshana Prasaraka Mandali, Prof Dr Suhas Pednekar, Principal, Ruia College and Veteran journalist Shri Prafulla Marpakwar graced the occasion with their august presence along with other dignitaries from Shikshana Prasaraka Mandali. A total of 523 students graduated this year at WeSchool across its six PGDM programs (ATCTE approved, Two year, Full time) in General Management, Retail, Healthcare, Rural Management, e-Biz and Business Design. 49 Academic toppers from each program received Certificates of Merit during the graduation ceremony. Shri Nitin Gadkari, Hon’ble Union Minister for Road Transport, Highways & Shipping inspired the young brigade by sharing his thoughts on the India of his dreams and power of youth, “This is one of the most important days for you and I am privileged to be a part of it. Innovation, entrepreneurship, technology and research are all related to knowledge and conversion of knowledge into wealth is the future of our country. As young student-citizens let your managerial skills become the engines of change and growth for our society and nation. Resources and technology will certainly be your assets but the combination of positive approach, transparency, corruption-free work ethics combined with collective team spirit will be the key to your success whether in business or politics.” He concluded his address by congratulating the graduating students and wished them luck for their future. Advocate Shri S K Jain, Chairman, Managing Council S P Mandali and Local Managing Committee, WeSchool in his short address urged the students, “This is an era of change due to technological disruption and globalization. One must be successful not just for himself but also to be able to contribute to the society and nation.” He also administered the Convocation Oath to the graduating batch. Convocation is not the end, it is most certainly a moment of honor and pride and also a new beginning as the young students get ready to step into their chosen corporate careers or enter the start-up arena. It is WeSchool’s mission to nurture corporate excellence through well trained managerial talent along with being a supporting platform for start-ups and aspiring entrepreneurs. As one batch of graduate steps out to take up their rightful places in society ,WeSchool strives forward with its action plan to see to it that more and more successful ventures roll out of its campuses, more of social innovations come from its fraternity. The Convocation thus was truly the manifestation of WeSchool’s intentions, actions and efforts towards achieving excellence.